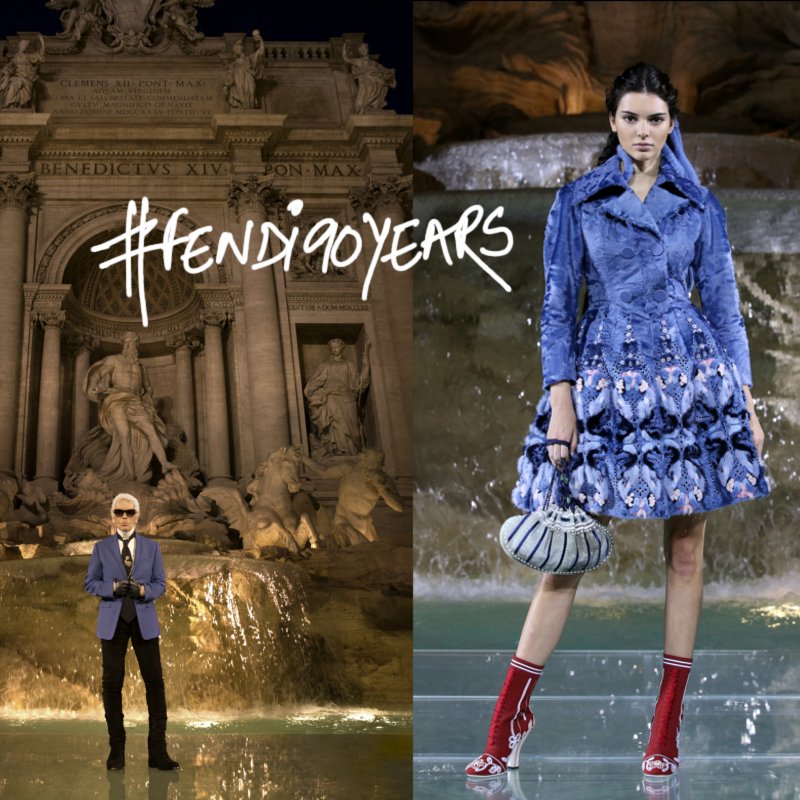 FENDI sealed once more its profound and long-lasting bond with Rome, by choosing its hometown to celebrate the 90 years anniversary of the Maison. The event started on 7 July late in the afternoon with a private cocktail at the San Luca Academy inside Palazzo Carpegna, an historical Roman Palazzo hosting an artists’ association founded in 1593, just a few steps away from the Trevi Fountain, where it was launched - as a worldwide preview - the FENDI ROMA book. The book, conceived to celebrate 90 years of the Maison, its history, identity and the profound link with the city of Rome, has been presented in an exclusive set up inside the exhibition area where its photographic images were displayed as in an art gallery. The celebration continued at the glorious Fontana di Trevi, for a never seen before fashion show with the Legends and Fairytales Haute Fourrure Collection, disegned by Karl Lagerfeld, once more an example of the unique craftsmanship, daring creativity and expression of the excellence of the Roman Maison. The Trevi fountain’s water and play of lights fused with the catwalk rhythm giving life to an iconic Roman atmosphere. International Top models as Kendall Jenner and Bella Hadid walked down the transparent catwalk placed on water during sunset time as floating fairies. The fashion show was followed by a breath-taking dinner at Terrazza del Pincio in Villa Borghese, that hosts one of the most amazing landscape views of Rome. The guests walked through a corridor immersed in Karl Lagerfeld’s sketches since 1965, a special artwork called Gust of Wind conceived by the internationally renowned designer Paul Cocksedge Studio. An unexpected and circular “FENDI fountain” was constructed embracing the dinner venue to underline once again the profound and historic bond between FENDI and the roman fountains. The dinner was followed by a special performance by Giorgio Moroder, an icon and live legend of the disco music, that has collaborated with the biggest stars on earth as Barbara Streisand, Freddy Mercury, Donna Summer and Daft Punk. He has an award winning record: 3 Academy Awards for the music of the famous movies Top Gun, Flashdance and Never Ending Story, 4 Grammy awards and 4 Golden Globes and more than 100 Gold and Platinun Records. On 8 July, guests were invited to the preview of the exhibition FENDI ROMA – The Artisans of Dreams at Palazzo della Civiltà Italiana’s first floor, designated to host exhibitions open to the public throughout the year, followed by a brunch on the terrace of the first floor of Palazzo della Civiltà Italiana. The exhibition, open to the public starting from 9 July, is conceived to celebrate the Maison’s unique craftsmanship and creativity, founding and distinctive elements of the luxury Roman House core values. FENDI also presents the ultimate sublimation of the Peekaboo bag and the Selleria line with the exceptional PEEKABOO 90 YEARS, designed by Silvia Venturini Fendi, a one-of- a-kind bag entirely made by hand in only 60 pieces, created to celebrate the 90 th anniversary of the Maison. With the most ancient techniques of the Roman master saddlers, the PEEKABOO 90 YEARS, is sold exclusively in the Palazzo FENDI boutique in Rome, starting from July 2016. Special windows have been developed exclusively for the Palazzo FENDI boutique to celebrate the 90 years of the Maison where special paper craft techniques are used to illustrate the story of the Maison, where suitcases become the cover of a giant books and paper miniatures, examples of fine craftsmanship, represent the five Fendi sisters, Karl Lagerfeld and Silvia Venturini Fendi. FENDI, together with Karl Lagerfeld and Silvia Venturini Fendi, celebrated on this occasion, 90 years of the Maison’s great revolutionary worldwide achievements, avant-garde experimentation, unlimited research and innovation, proposing new luxurious and modern fur designs and accessories.